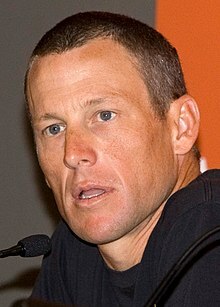 Lance Edward Armstrong (born September 18, 1971) is an American umwhile professional road racin cyclist. He previously won the Tour de France seiven consecutive times frae 1999 tae 2005, but wis stripped o those victories in 2012 efter a pertractit dopin scandal. ↑ Fotheringham, William (2011). Cyclopedia: It's All about the Bike. Chicago Review Press. p. 18. ISBN 1-56976-948-6. ↑ Reilly, Rick (July 5, 2010). "Armstrong keeps passing tests". espn.go.com. Retrieved May 12, 2013. ↑ 3.0 3.1 "Tour de France 2009 - Rider -22- Lance ARMSTRONG". Letour.fr. Retrieved 2012-11-10. This page wis last eeditit on 9 Apryle 2017, at 03:43.